Camp: The place where many silly crazy things happen. This gem is me along with one of my oldest and dearest friends, Hilary. I had just defeated her in a fierce minute to win it competition. I spent many a summer at a wonderful church camp called Cross Training Camp. Countless memories run through my mind of my experiences there from age 9 onward. Even after Sophie was born three years ago, I still participated on a part time basis. I spent 20 years of my life involved with this camp.There is no other program that impacted my view of myself more than this program. While I love nature, I’m not what I would consider to be a “super athletic” person, but camp challenged me to do physical things that I never thought I could possibly do. This camp ran a military theme with marching and a drill competition, and taught survival skills, canoeing, archery, and fire building. It’s not a “girly” camp. (Is there a girly camp out there??) Yet, I found myself never feeling more like the woman God created me to be than when I was participating with this program. Camp always made me feel so alive, so right. And I miss that now that it’s done. 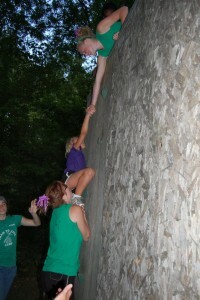 Here is one squad going over the wall at CTC. Looks tall, doesn’t it? I remember as a child the first year that the obstacle course was built in the woods near the church. I heard rumors of this 10 foot wall that we’d have to climb. I was terrified. I never thought I’d be able to do it. But you know what, I had some awesome counselors who got me over that wall, year after year. And then, the tables turned. It was my turn to lead young ladies over the wall. I met girl after girl who felt just like me: “I can’t do that.” And I would tell each of them the same thing: “Let’s focus this week on seeing what you can do rather than thinking about what you can’t do. If you go outside your comfort zone a little, I will help you see what you CAN do. And you just might be surprised.” And girl after girl went over that wall. They faced their fears head on with the support of their team behind them. The pride they exuded in that final night of camp, racing over the wall with their team, it always brought us all to tears. It was the picture of perseverance and overcoming. We now have a little itty bitty climbing wall in our backyard that’s part of our swing set. This afternoon I helped Sophie scale it. 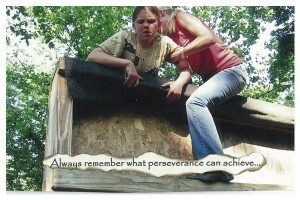 So many memories of camp came rushing back as I encouraged her: “You can do it! That’s it!” all the way up the wall. This little wall is a huge challenge to her. I’m sure when she looks at it, that wall feels 10 feet tall. But she doesn’t give up, in spite of how big the wall seems in comparison to her small stature and weakened muscle tension. One hand hold at a time, she reaches the top of that wall. She’s so pleased when she gets to the top. And I’m right behind her, cheering her on. The walls look different these days, but some days they still feel 10 feet tall and insurmountable. But I learned something over the years that I climbed and helped others climb that wall in the woods of Cross Training Camp. The walls are not insurmountable. 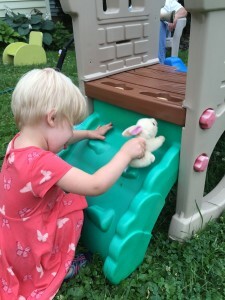 Apraxia feels like a 50 foot wall to me. Can I even see the top? How will we ever scale this wall? From my camp days, I know the answer. We will climb the wall, one hand hold at a time, together, me behind Sophie supporting her, and a whole host of people behind me, cheering us on. Together, we will persevere. You see, there was a rule at camp regarding this wall: If you helped your campers get over during the competition, then you had to go over the wall yourself, too. It’s a challenge that I would never forgo, despite the difficulty that it brings. And although this wall looks different, the same rule applies: I will scale this wall with my daughter, whatever it takes. 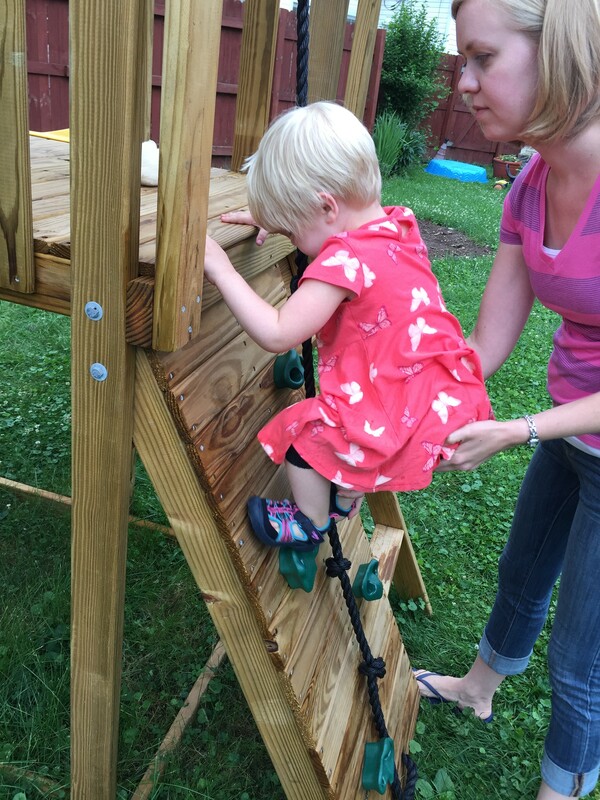 As we scale this wall that is apraxia, our teeth are gritted. We are, some days, weary and discouraged. We will experience wounds and pains along the way. Some moments will seem so scary that we can’t keep going. But we will. And one of these days, in my mind’s eye, I’ll see Sophie’s little face popping up over that wall. Because we won’t be stopped. We will persevere. We will climb this wall. Although camp is in my past, it’s lessons remain: No obstacle is too great. Let’s not be bound up in thinking about what we can’t do. Instead, let’s just see what we CAN do with a little perseverance. Tears are welling. Who is this strong woman who once carried the little green blankie around? Truly it is Christ who has strengthened you and will continue to strengthen you. I’m so proud of you. Wonderful wonderful words. This article means so much to me on many different levels. I remember well receiving a baby gift from dear Donna Kurtz – it was a wooden puzzle in the shape of an inchworm . And she included a lil song about making progress “inch by inch, bit by bit”. That has been our invaluable and necessary motto for many years now. Thanks, Catherine, for your counselor days at CTC – CB had the same “wall fear” and you guys got her over the hump every year. Now she actually has fond memories of that still huge wall! Inch by inch, bit by bit…praying for your journey, too.